The third ‘All England squid Fishing Championship‘ was held yesterday on the East arm of Brighton Marina with a good turnout of 48 competitors who raised £240 for the RNLI. In comparison with last year, when the competition was held in warm sunshine and I got sunburn, the start for this year was somewhat different – cold NNE breeze (very light) and light rain. Last year was ‘T’ shirts, this year was waterproofs and thermal wear. It has to be said though, that later on, the breeze was virtually zero and the slight rain was patchy to zero, so not that horrendous. Before going to the appointed meeting place, I popped into ‘The Tackle Box for a few bits ‘n’ pieces. Being someone with a limited memory, I had written ‘Bait Elastic’ on the back of my hand, it was unfortunate that I had omitted to write or add ‘Bait’ to the list, as that vital item was sitting forgotten at home in the fridge! Everyone met up at the café on the East arm at 4pm where entrance money (towards RNLI charity) was handed over and in return, entrants were given a Tronix squid jig in the colour of their choice, I opted for a very fetching green. We drew numbered score cards that denoted the order in which contestants walked off for the start – I drew no.10 which wasn’t too bad. Soon we were off and walking to wherever we could get a space. Another WSF member, ‘mr codling’ and his cousin ‘Ant ‘ were just before me but we decided on fishing together so that witnessing and card signing would be easier. We eventually found some vacant space at bays 41-43 and started to set up. We were also joined by Mr and Mrs Wee Haggis and their usual large amount of kit. Official kick off was 5pm and at that time, many jigs were cast out in expectancy and 48 pairs of eyes stared at floats, waiting for them to slide under the surface. In our little merry band, Mrs Haggis was the first to strike within the first 10 minutes and after I wielded the net, her first ever squid was safely on the deck. It was quickly dispatched, measured at 37cm and put in the cool bag. Things were looking good and it promised to be fruitful session. After this first bit of activity, I’m afraid I got lost in it all and couldn’t tell at what happened at what time but my turn was next when I had a reasonable sized Cuttlefish on the line which escaped during the attempts to net the thing – my first chance blown! It wasn’t until quite a way into the session that my next chance came when I hook a squid, which got to the surface and then let go. I immediately let the jig back down and luckily, the squid grabbed it again and this time was safely netted by wee haggis. After measuring the critter (37cm) and getting my card signed, it was back for attempts at more; in my case no more, as that was it for me – not even a sniff at another squid or cuttlefish. For the rest of the time, we saw no more action apart from wee haggis getting a mackerel on his jig and Ant managing to bring in a black bream on his…. weird! I did get to enjoy some very nice coffee from Mrs Haggis’ ‘kitchen’ which was certainly better than what I had in my flask. Before long, it was 10pm – the finish of the competition and the walk back to the meeting point, totting up of points and the giving out of the awards and prizes. 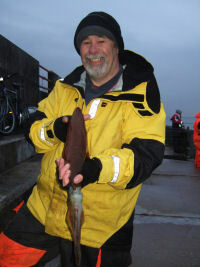 Sadly, I got nowt for my efforts apart from a tasty squid for dinner and a great time in good company – just hope next year is a bit warmer and drier. Competition results can be viewed here. Hopefully, I’ll have some photos to add soon. 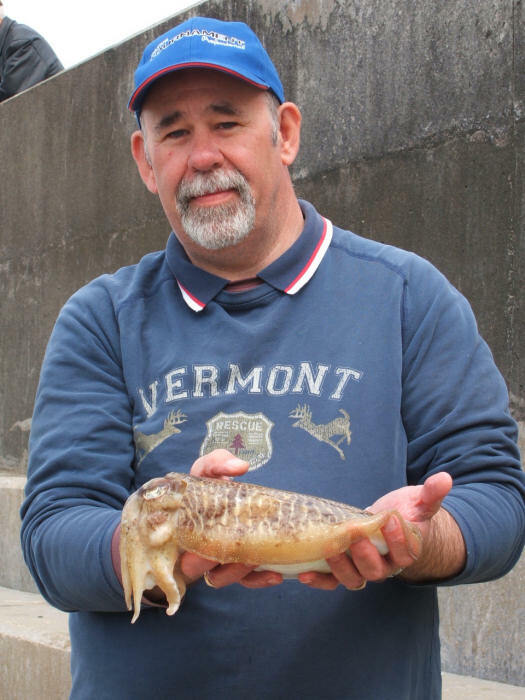 I had another early start at Brighton Marina yesterday morning in the quest for tasty Cephalopods and some practice for the upcoming 3rd All England squid Championship on the 8th of May. After a quick visit to the Tackle Box for some more leads (Cheers Eddy for opening up early), I headed over to the West arm and grabbed a spot at the ‘Float Only’ bays at the end about an hour after low water. The weather looked promising with an overcast sky, very light Southerly breeze and a flat calm and clear sea, so I was optimistic as I set up the now standard rig of float fished jigs. I bucked the trend of using pink jigs and within minutes had cast out a green Tronix jig to do it’s work in the current which was running quickly as the tide rose. I guess it must have been around 9am when I had my first take which saw the float slide under the surface. As the creature got to the surface, it gave an almighty spurt, slipped the jig and disappeared. Buoyed up by the take, I was confident that others would follow and at about 10.30am, I had another take which saw another squid on the surface. I could see that it was comparatively small and so had no problem swinging it up without using the net. First one done, I worked the float through the swim in the hope of a quick follow up but it all went a bit slow with only a couple of missed takes. Danny, one of the guys from the WSF internet forums turned up about 11am for a bit of a chin wag and fishy talk of plans for the summer. My wife Anna joined us half and hour later, wanting to see how her delicious squid dishes start out and how they’re caught; it also gave us the chance to blow the cobwebs away over losing one of cats on Tuesday when he had to be put down. Just before mid-day and the top of the tide saw the action quicken when I had a take and a squid on, it looked pretty small and I thought I’d have no problem in swinging it when, despite the kind offer from a nearby angler to net it for me. The result? bloody thing dropped just as I was beginning to lift it. The next two successive takes resulted in the squid letting go as they were about to surface. Another take and some good netting by Danny saw a lovely Cuttlefish safely on the deck. It wasn’t until 1pm, after Anna and Danny had gone and two dropped takes later that I had another squid on; this one stayed on and was kindly netted for me by the guy in the next bay. His services were required shortly after when yet another squid was on. This one made it all the way to the net before slipping off at the last second. There was no more action for me after this but at around 3pm, a local angler of many years, ‘Farmer George’ landed a good sized squid after he had settled in my bay. By 4pm I had had enough for the day, and as I was working that evening, I had to leave – pleased with the result but annoyed at the missed opportunities. 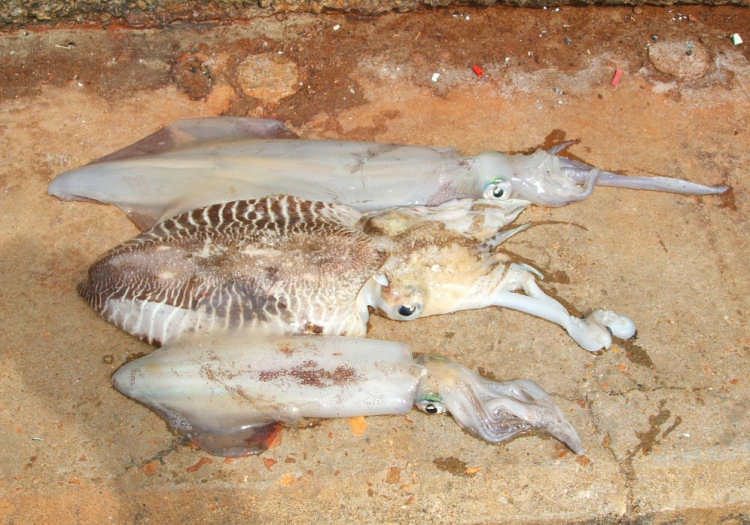 With inclement weather forecast for the next few days, here’s hoping that by the time the squid competition comes around next week, the conditions calm and clear out, otherwise it means postponement.